I haven't blogged lately as I really didn't have anything to say. I've been knitting a bit, but nothing was quite photo-worthy along the way. This evening I took a picture of the Carmichael Aran. It's all finished, except for the neckband. However, I've run into a problem and I'm not quite sure what I'll do about it. I welcome suggestions. Each piece was knit to gauge and turned out to be just the size that I wanted it to be. I soaked each piece in Soak and the pieces became large and loose. I was worried. 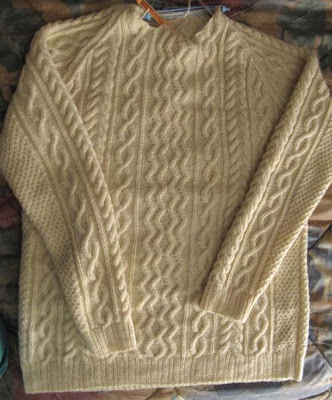 I blocked each piece, nudging it back to the size that it was when I was knitting, the size I wanted the piece to be. I thought that all was well. I was wrong. I sewed the pieces together and the sweater looked long. I hoped that it was just an optical illusion, but unfortunately it wasn't. The sleeves and body had grown by about 1-1/2" to 2" in length. The width is about half an inch wider, nothing I'll worry about. Now, the dilemma. What do I do about it? Should I wet and block the sweater again? Would I dare to put in the dryer, even for a very short time? Something else? I did do a swatch and it, too, came out looser and bigger, but when I pushed it gently back to the original measurements, the piece stayed put. It didn't gow as the sweater did. This is an overdue gift. I'd like to get it in the mail and off to the recipient and start on something else. What's this knitter to do? I don't think a little extra on the body is a bad thing and the sleeves cuffs can be turned up. It is so beautiful! I wonder if some carefully supervised dryer time would be in order. Maybe 5 minutes on low, quick check, and then more time if things are looking OK. I guess it is a risk, but maybe it would bring it all back together enough that you could lay it out and allow it to finish drying. I am looking forward to seeing this completed. It looks excellent.